The apartment is completely oriented towards the wide square of Pedro Zerolo, old Vázquez de Mella. Both the living room and the room have separate viewpoints which make it a very bright and cheerful apartment. The room is quite spacious with a large built-in wardrobe. The room and the room have air conditioning. The kitchen is fully equipped. The apartment is at the entrance to the Chueca neighborhood and a few blocks away is the Malasaña neighborhood. Throughout the area there are numerous bars, restaurants and small shops of all kinds. Despite this, the square where the apartment is located is relatively quiet at night. On the other hand, it is a few meters from Fuencarral street and 5 minutes from Plaza del Callao and Puerta del Sol. In 10 minutes walking from practically all the theaters of Madrid, the Prado Museum, the Thyssen Museum, the El Retiro Park. Just a few minutes away are the Gran Vía and Chueca stations (lines 1 and 5 of the Metro). The Sol (Metro and Cercanías) and Recoletos (Cercanías) stations are very close. From the latter there is a direct train to the T4 of the airport and from both stations all trains go to the Atocha and Chamartin stations. From the Plaza de Cibeles there is a bus that goes directly to the airport 24 hours a day. I am from Bilbao but I live in the center of Madrid for some years and I think it is great because it is like living in a small city but surrounded by a capital of 6 million inhabitants with the services and possibilities that it entails. I bought the apartment before coming to live in Madrid. I loved the house because the whole house looks outwards, it looks like they are in the same square. On the other hand is in a great area to enjoy Madrid in the plan you want. There is no need to take the car to go anywhere, nor even the subway. It has a large refrigerator with separate door for frozen. Great location with a bright sunny view of the square. Can highly recommend this excellent apartment located close to Gran Via metro. (Good for Prado, Retiro park etc. 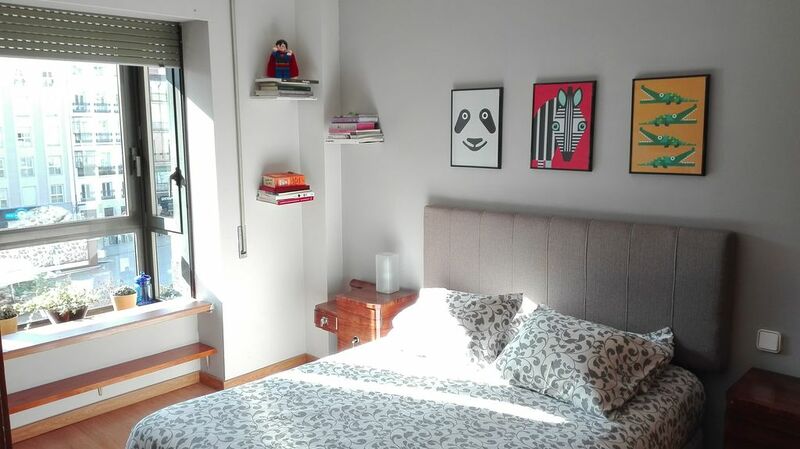 )Apartment is clean, bright and fairly spacious, and has a wonderful view across the square of Pedro Zerolo. The kitchen had all amenities and the bedroom was comfortable with ample wardrobe space.Our host Inigo, was very friendly and helpful and his recommendations were much appreciated.We had a very enjoyable 4 days in Madrid. El apartamento es muy acogedor, amplio, luminoso y limpio. Iñigo superatento y respondiendo de inmediato todos mis mensajes. Muy céntrico, limpio y con todo lo que necesitas para el día a día (lavadora, productos de limpieza, plancha...). Además, Iñigo muy atento en todo momento, sin duda será nuestro alojamientos cuando visitemos Madrid. A 2 calles de la Gran Via, cerca de restaurantes y supermercados, del metro. Facil acceso. Elevador. Recomendado. Excelente ubicación a escasos metros de la Gran Vía, en edificio tranquilo. El apartamento está completamente equipado y es muy luminoso y acogedor. Ideal para estancias cortas en el centro de Madrid. Muy buena comunicación con Íñigo, el propietario. Attractions: Gran Vía, Fuencarral, Theatres, Prado Museum, Thyssen Museum, El Retiro Park. You'll love my place because of the cozy space, views, and location. My accommodation is good for couples, adventurers, business travelers and families (with children).